Galileo first observed 4 moons of Jupiter in 1609, using his telescope. There was some sort of controversy at the time, and Simon Marius may have discovered them at the same time, or, more probably, slightly later. Anyway, Marius still got to name the moons, according to 4 lovers of Zeus: Io, Europa, Ganymede, and Callisto. For those who did not have the privilege of learning Greek mythology in school, Zeus is a Greek god (actually, the father of gods), and Jupiter is its equivalent in the Roman religion. Zeus had countless lovers (and children), but Europa seems to have quite a successful career as namesake, since she also gave her name to a continent. Not bad, huh? These 4 moons can easily be seen with a pair of binoculars. 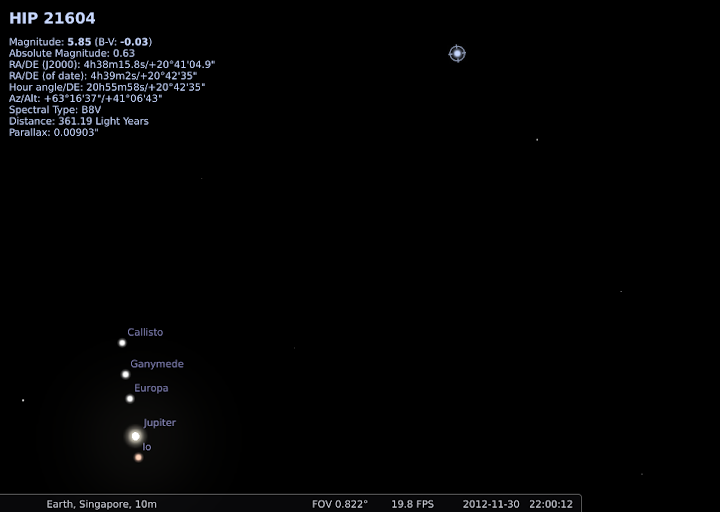 Actually, they could even be seen with the naked eye, were it not for their close proximity to the bright Jupiter. Anyway, the other night, I saw a bright spot in the sky, figured out, using Stellarium, that it was the planet, and started wondering if I could take pictures of it, with its 4 largest moons. So, I mounted my recently acquired 45-150mm lens on my Panasonic Lumix DMC-GX1. I set the maximum focal length (150mm on a Micro 4/3 corresponds to 300mm on a 35mm camera), and largest aperture (f/5.6), to get as much light as possible. I also use the digital zoom of the camera (4x). I fixed the camera on a small tripod, and put it in manual focus (autofocus does not work on stars ,-)). It is actually fairly difficult to focus properly: the infinity mark on the camera display corresponds to a focus distance past the infinity (i.e., always blurred). Apparently, that's a common issue with cheap lenses: the lens is manufactured with some margin for error, and they build the focus scale in such a way that you are guaranteed to be able to focus at infinity, but not necessarily where it says so. I cropped the images after taking them, but did no other processing (unless otherwise mentioned). Looks good! There is some chromatic aberration around Jupiter (the red and blue patches respectively under and above the bright white spot), but apart from that, it looks quite ok.
Can you see the dot on the top right? According to Stellarium, it's a star called "HIP 21604" (what a boring name ,-))... The software also gives you the name and positions of the moons: Callisto, Ganymede, Europa, and Io. You can also tell that the field of view of my images is about 0.8°. I cropped the original images by about half, so the field of view of my lens, at maximum focal length, with 4x digital zoom, is around 1.6°. To give you a point of comparison, the moon and the sun both have an angular diameter around 0.5°. Finally, I probably live in one of the worst place to take pictures of stars: in the middle of a bright city, with high humidity in the air. So expect better results if you live in a place with a clearer sky! It would be nice to see what results we can get using RAW images, to get rid of JPEG compression artefacts, and without using the in-camera digital zoom. But that will be for another post!